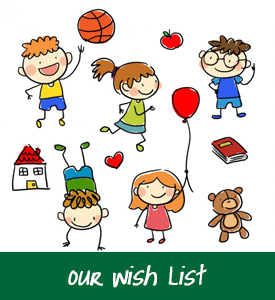 Often it is necessary to point out the disadvantages of society in order to create an awareness and generate financial support to help with the continuous demand of maintaining Talhado Children’s Haven. However, it’s sometimes best not to sew labels onto members of our community. 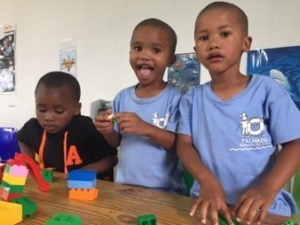 Words like “underprivileged” and “previously disadvantaged” should be used with caution when describing the learners of Talhado Montessori. I believe that the children attending our school are privileged for having the opportunity to learn under the guidance of qualified, dedicated teachers, using specialized materials and equipment, and in classrooms that sparkle with energy and an abundance of love. We instill self-esteem, which plays a huge role in success. I hope I get to see these learners grow up to be confident, determined adults who will, one day, pursue their own happiness. 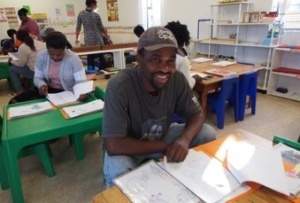 The year started with a BANG as we saw 78 learners enrolled in our two classrooms. 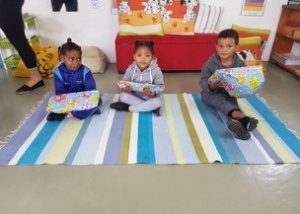 Amongst our four Montessori teachers, we have managed to cater to the needs of these learners. Even though the numbers have increased from our 60 learners of last year, we still have a waiting list. Hence, in the Easter term we are opening an additional classroom which means our numbers will increase to 90 learners. We are trying to keep up with the demand of the community without sacrificing the standard of education that is offered at Talhado. Parent/Teacher evening was held on the 19th March, where parents were invited to the classrooms to browse through their child’s work, as well as their progress report. 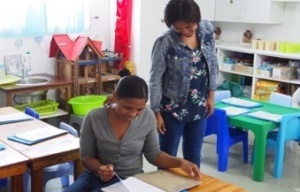 The teachers gave talks about how the Montessori classroom functions, and demonstrated some of the materials we use, to give parents an understanding of what happens during their child’s school day. The evening was well supported and it was heart-warming to see so many moms, dads, grandparents and carers showing a keen interest in their child’s education. 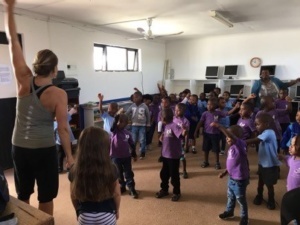 Georgie Tovell and Vidette Jorge brought a new concept to Talhado in the form of kid’s yoga. Everyone was delighted with some fun moves and grooves. 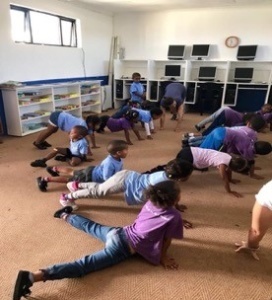 The children are eagerly looking forward to their next yoga class. 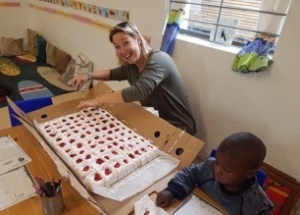 The Ukupha ladies are keeping up with the birthday celebrations as they arrive monthly, arms laden with gifts for the birthday children and cake for everyone! How we look forward to those moments, thank you Ukupha ladies! Our jersey drive is commencing nicely. If anyone is still knitting please make a note that we will be handing out jerseys, beanies and scarves towards the middle of April, just before the cooler weather sets in. 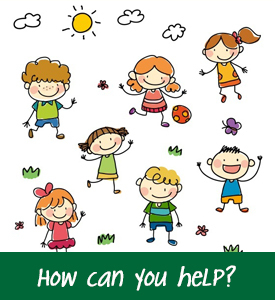 Please hand in completed knitted items to Nomvula’s or directly to Chamel in our school office. I will let you know of a definite date when we have one in case you would like to participate in the handing out of the knit-wear. 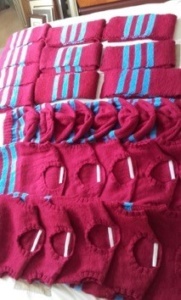 Please let’s all make a concerted effort to get knitting over the Easter holidays so that every child at Talhado can be the proud owner of a school jersey, scarf and beanie! On that note … thanks to the latest contribution of knitted items (see photo below) from Sharon Mungall’s mother, Lesley, in Scotland. These were carried back in my suitcase all the way from the UK last week. Congratulations to one of our staff members, Leigh Ann Mofu, on the safe arrival of her healthy and beautiful baby girl, Lisithe. Leigh-Ann is our current librarian and will also join our classroom as assistant teacher at the beginning of the April term. Rotary Woking, from the UK, are funding the furniture for our new classroom. They have supported Talhado tremendously and we are looking forward to showing off our custom-made, child-size tables and shelves soon! Thanks to Christina Fishing, St Francis Sea Products, TTM Fishing, Humansdorp Community Factory Workers for their generous cash donation. Shelley Donaldson who has offered us free advertising in the Info-Ads publication! Wendy and Craig, our friends from the UK, held a collection for Talhado Montessori at Southrop School, which they are closely associated with in the UK. The money they handed over was used to purchase Maths and Language materials for our new classroom. 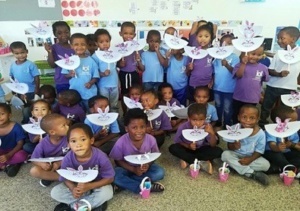 Danielle and Phil Clack from Devon, UK, donated to Talhado on a recent visit to South Africa. They also visited the school where their two sons enjoyed assisting the children with their activities. We had a few people who chose Talhado to be the beneficiary of events and gifts over the Christmas period and we extend our thanks to every one of you. Tim and Anne Briscoe, thank you for the brilliant book donations! 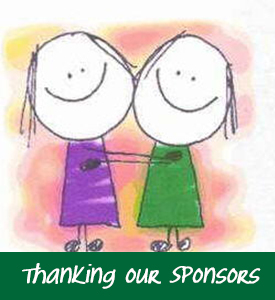 Thanks to all of you who have donated to the school fees fund. This helps us in keeping our school fees to a minimum of R175 per month. I’m afraid I may omit someone in error if I try and name everyone. Talhado is grateful to all of you. The increase in children at the school has brought about financial challenges as we continue to provide two meals a day for the 90 learners, not to mention the increase in other costs such as stationery, education and Montessori materials, staff salaries etc. If your company or family would like to be a part of this movement in education through any contribution please contact me. We are a registered NPO and can provide you with a tax certificate. We eagerly look forward to everything that the second term holds in store for us!